China’s new rural development campaign (Xīnnóngcúndianshi) was initiated in 2003 and has reshaped the agricultural sector in Hubei. Reductions in the public sector workforce led to redundancies in the central Chinese province, motivating several extension workers to move into the private sector, selling agricultural inputs whilst at the same time continuing their extension work under contract from local bureaux of the Ministry of Agriculture. I spoke to one such gentleman during a pilot study for the STEPS Rethinking Regulation project. (Photo: Zhang in his shop / Adrian Ely). Zhang has been working at the agricultural extension centre in Tiānmén County, Hubei Province, since he graduated with a Masters degree from Huazhong Agricultural University 21 years ago. 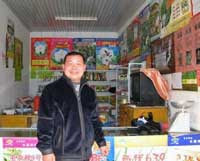 He is a prime example of the individuals at the centre of China’s changing agricultural extension system. Like many colleagues, he has recently (last year) established an enterprise of his own, and estimates that he provides one third of 12,000 Tiānmén’s farmers with seeds and other agricultural inputs. Zhang stresses the importance of local conditions in the selection of seeds and management practices, and draws upon his knowledge of the local area in his work with farmers. During the past two decades he has broadened his knowledge according to the evolving needs of the local community: developing his expertise in the use of fertilisers, horticulture, plant protection and even fisheries. The trust he has built over the last two decades is now paying dividends. The rapid changes in China’s extension system have not been without their downsides, however. Redundancies in the system have left families without an income, and the economic incentives resulting from the reforms have led to some behaviours that have disadvantaged rural farmers. Previous reports of extension workers abusing their positions by selling low quality counterfeit seeds have compounded the problems of quality control in the Chinese seed sector. The STEPS Centre’s “Rethinking Regulation” project aims to investigate the strategies that farmers themselves adopt to secure the benefits of these new seed technologies, whilst guarding against any associated risks. At least according to this extension entrepreneur, the situation in the relatively wealthy county of Tiānmén is improving,. In Mr Zhang’s opinion, Tiānmén’s recent success is primarily down to the peaceful and stable period in the region’s history. He also attributes the agricultural development in his county to technological progress and the increasing reach of the agricultural extension services. Wages from migrant labourers, which often make up more than half of a household’s total income, supplement the money earned locally. When I asked Mr Zhang what he expected for the next 21 years of agriculture in Tiānmén County, he was unhesitating in his optimism. The improvement of technology and the hard work of extension services at the county level will bring a bright future to Tiānmén’s farmers.